Hemant Oberoi, the Group Executive Chef at Taj Hotels Resorts and Palaces and arguably India’s most influential chef, was in Cape Town to oversee the preparations for three new restaurants in the new Taj Cape Town. It is only in the past year that we have started to have celebrity chef restaurants arrive in South Africa – with first Gordon Ramsay (Maze), Nobu Matsuhisa (Nobu) and now Hemant Oberoi. 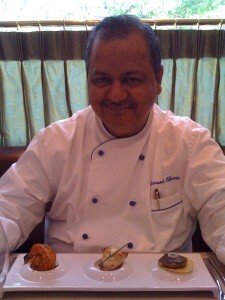 Oberoi as corporate chef for this luxury chain opens over six restaurants worldwide every year. The Cape Town Taj will have the upmarket Bombay Brasserie (after their establishment in London), the smart casual Mint which opens on to St George’s Mall, and Twankey (a wine bar and Indian tapas style restaurant) on Adderley Street. Oberoi is a charming, soft-spoken man who shoulders an enormous amount of responsibility with ease. He was caught in the Mumbai Taj Hotel during the terrorist attack and subsequent siege. The experiences he related at lunch were truly horrific. Yet, it has not changed his positive attitude to life. The chef’s table was very fine indeed. We will watch with interest for their official opening.